Image caption The note is now a collector's item, but no use for train travel. An elderly man in China has tried to buy a train ticket using currency not in circulation since 1949, it's reported. The 80-year-old man handed the 500-yuan note to a ticket seller at a train station in Yongkang, eastern Zhejiang Province, the Global Times website reports. 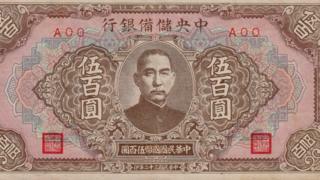 The note is almost as old as its owner; it was printed in 1943 under the Republic of China and features the face of the country's founder and first president, Sun Yat-sen. It has been obsolete since the People's Republic of China was founded in 1949. But the man, identified as Mr Ying, was reportedly adamant that the note should be accepted, asking: "It's a 500-yuan bill! Why did the seller refuse to take it?" Mr Ying was trying to pay for a train ticket costing 12.5 yuan ($2; £1.30). But rather than pocketing a heap of change, he was informed his note is no longer legal tender. While the note wasn't much use at the station, it could still prove valuable to Mr Ying. Currency from the era is now considered a collector's item, and some 500-yuan notes are being sold on internet auction sites for more than $100 (£64).